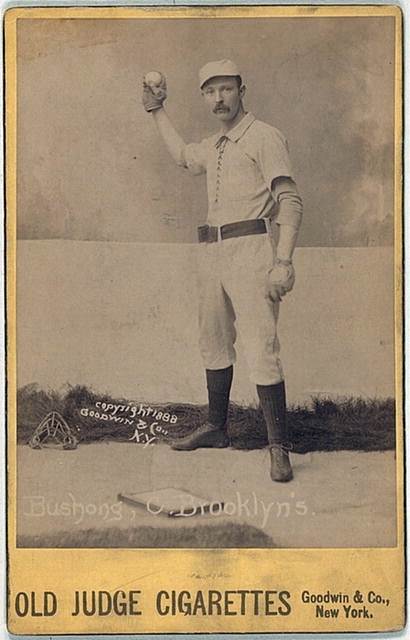 Albert John “Doc” Bushong made his major league baseball debut in 1875, as a catcher for the Brooklyn Atlantics of the National Association. During his lengthy major league career, which lasted until 1890, he also played for the Philadelphia Athletics, Worcester Ruby Legs, Cleveland Blues, Saint Louis Browns, Brooklyn Trolley Dodgers, and Brooklyn Bridegrooms. Bushong batted and threw right-handed. In 1882, while still a professional baseball player, Bushong graduated from the University of Pennsylvania with a D.D.S. degree. He did not play baseball for Penn. After his retirement from professional baseball in 1890, he practiced dentistry, first in Hoboken, New Jersey, and then in Brooklyn, New York, where he died in 1908.